During the 1990s, the Hispanic population increasingly resided in counties that had not been long-standing magnets for Latinos. The counties attracting Latinos in the 1990s are not identical to the 676 fast-growing Hispanic counties that have been attracting Latinos since 2000. Hispanic dispersion in the new century is more tilted toward metropolitan counties and counties in the West and Northeast. From 1990 to 2000, the Hispanic population increased by 12.8 million (58%) in the 1,362 counties that had at least 1,000 Hispanics in 2007.1 In 681 counties, the Hispanic population grew by at least 90% during the 1990s, and we identify those counties as fast-growing Hispanic counties during the 1990s. Map 3 shows the counties attracting Hispanics at a rapid rate during the 1990s, and it is not identical to Map 2. In the new century, 447 of the fastest-growing counties are metropolitan counties. In the 1990s, only 381 of the fastest-growing counties were metropolitan counties. 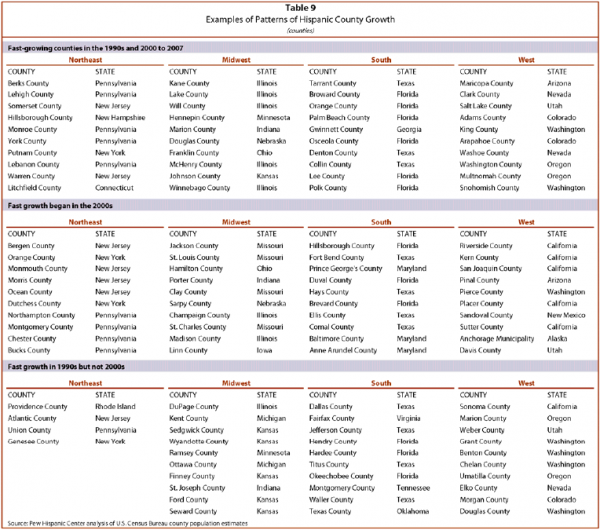 In addition, a smaller share of the growth in the fast-growing counties during the 1990s was in metropolitan counties (89%) compared with the new century (94%) (Table 7). 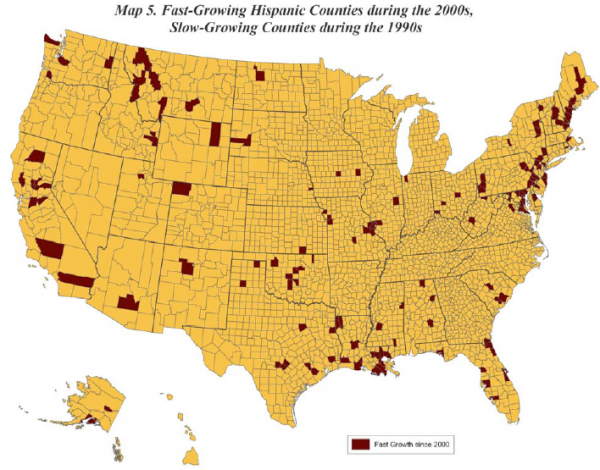 Regionally, Hispanic growth since 2000 has shifted toward counties in the West and Northeast. The number of fast-growing Hispanic counties in the Northeast has increased from 24 counties in the 1990s to 54 counties in the new century. The share of Hispanic growth in the fast-growing areas has picked up in the Northeast from 3% in the 1990s to 6% in the new century (Table 8). Western counties accounted for 28% of the growth in fast-growing counties in the 1990s. The share of growth in fast-growing Hispanic counties among Western counties increased to 35% in the new century. Though Hispanic dispersion has tilted more to counties in the West and Northeast in the new century, most counties that were fast-growing in the 1990s continued to experience above-average growth in the new century. 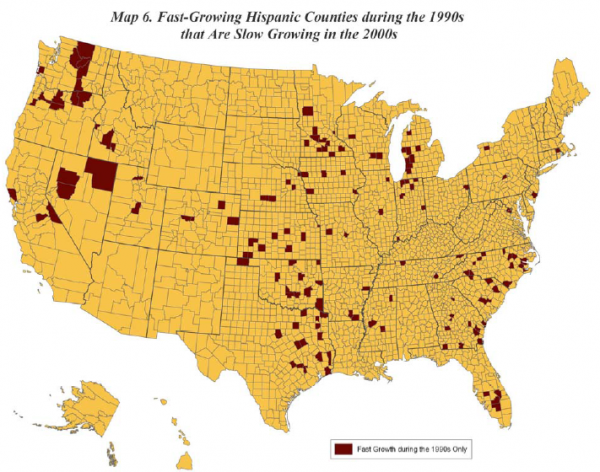 There are 528 counties that were fast-growing Hispanic counties in both the 1990s and 2000s (Map 4). 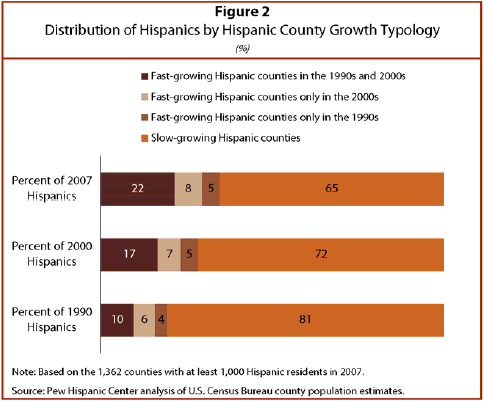 The share of the Hispanic population in these core growing counties steadily increased from 10% in 1990 to 17% in 2000 and then to 22% in 2007 (Figure 2). While each region of the country has counties that have steadily attracted Latinos, counties in the South are disproportionately among those that have steadily attracted Hispanics. There are 148 counties where the Hispanic population grew slowly in the 1990s but above average in the new century (Map 5). The new fast-growing Hispanic counties are disproportionately in the Northeast. Several of the new fast-growing Hispanic counties are in Maine, Vermont and Massachusetts. California also has several fast-growing Hispanic counties in the new century, and Louisiana is notable for the number of its new fast-growing Hispanic counties. Finally, there are 153 counties that had fast-growing Latino populations in the 1990s but have had below-average Latino population growth in the new century (Map 6). These counties are disproportionately in the Midwest. For example, Hispanic growth has cooled off in western Michigan, western Minnesota and western Kansas. Outside the Midwest, northern Nevada and central Washington were fast-growing in the 1990s but have experienced below-average Hispanic population growth in the new century.